I usually write about what I know, but today I will write about what I don’t know. I don’t know what I’ll eat tomorrow, when we’ll need new tires, and I certainly didn't know who would win the Super Bowl. I don’t know where her life is going, or how he’ll respond to my words. Honestly, I don’t know what God is doing in my own heart & life much of the time. What if it is better that we know so little about the future? Could it be merciful of God to show us such a small part of where our story, or a friend’s, is going? Why do we desperately grasp for control, when we are assured so little? How can we live into the mystery without being paralyzed by our lack of control? Living into the mystery of life, one day at a time, and letting go of control, can be liberating. You won’t find a formula for this peaceful, contented and messy life. By nature, we humans like things to be defined, black and white, bottled up and sold for a reasonable price. 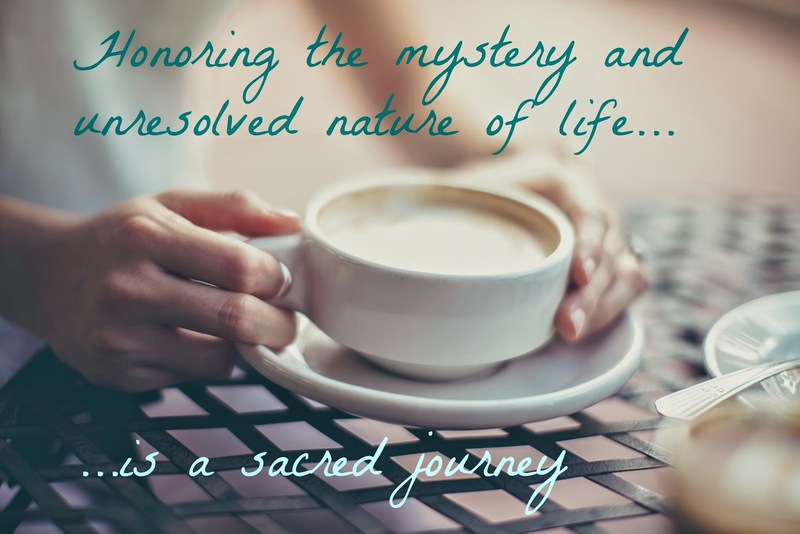 Honoring the mystery and unresolved nature of life…is a sacred journey. Embracing grace as we take slow steps forward, and many more backward. I am often harsh with myself for not knowing exactly how to respond to X situation or Y comment. Much of life is gray; words from the friend who kindly shared the above quote. I’m beginning to understand just what she meant, and it is both freeing and terrifying. In this season of life, I feel safer with the black and white; it is much easier to stay where I’m comfortable, or work towards the expected, rather than stepping out into the gray, with passion and conviction, despite the resistance I might face. But it is equally dangerous for a bold and self-assured individual to risk without wisdom, like a bull in a china shop, so confident in his/her opinions and choices that hearts are damaged left and right. Staying in step with the Spirit is the only way forward. I’ve been hearing Jesus’ words roll around in my head over the last few days - I am the Way, the Truth, and the Life. Holding onto this truth will lead us forward, and most likely, in very different ways. Will we allow our fellowship with Christ to inform our way forward, his words to become ours, his life to continue through ours? I’m becoming aware of how little I desire fellowship with Christ, but long instead for results, answers, direction. Prayer becomes empty when it is devoid of fellowship. In the same way, life becomes empty when we are always looking for resolution, eager to find answers and completion. The messy middle is where life really happens: tough conversations you were brave to attempt, pursuing a new venture with no guarantee of success, offering thanks and praise when the answers still don’t come. This is the substance of life, not the extras. What I do know, and am coming to embrace more assuredly, is that he is WITH me regardless of the path I take. Keeping company with Christ, in the midst of the unresolved, directly affects our posture towards others as we all ‘fail forward’. Can we give each other grace, and assume the best of each other’s hearts, even if we make very different choices, and come to strikingly different conclusions about gray issues? Can we remember that we are all 'in process'? There are certainly truths to live and be transformed by in the Word, directives that are not up for dispute, but I grieve at the judgement I see in my own heart and others’ over the gray areas. Find kind companions, who open new possibilities and bring unexpected joy, wrapped up in mystery just as we are. Be kind to your own soul as well. Embracing the tension of our responsibility and our Creator’s wise guidance in each choice, deepens our trust, joy, and peace. Resist the urge to leave the waiting rooms of life too early, or approach the next assignment with a consumer mindset. But do leave the waiting room when it is time, even if the knees still wobble. Sacred rhythms such as the Sabbath, fellowship around the Word, daily worship and generous living refresh our souls. Buoyed by these graces, we can patiently look for signposts and clues along the way. But let's not forget to lose ourselves in the wonders of nature, a child's laughter, and the deep unknown places of God's heart, expressed through a friend. I have a small sign above my kitchen sink that simply says, LIVE. One small word, with a very powerful message. Live today, entering the beautiful possibility of the unresolved season you are facing; perhaps you’ll find me waiting there too. There is glory in the messy middle, just as much as in the decision made, the project completed, the child all grown. Can we find grace for our hearts and others’ hearts as we stumble forward? What are your questions? Will you honor your heart in the midst of your unfinished story? Who will you invite into your mystery?